The venture-backed startup IPO market has remained strong over the past five quarters, with 20 or more IPOs in each of those quarters. I was curious how the strength of the IPO market has impacted the acquisition market. In particular, how the number and value of startup acquisitions has changed, and more specifically, whether there are any trends in the sizes of acquisitions. To get a better sense of these trends, I’ve analyzed the Crunchbase acquisition data for US tech companies over the last 4.5 years. 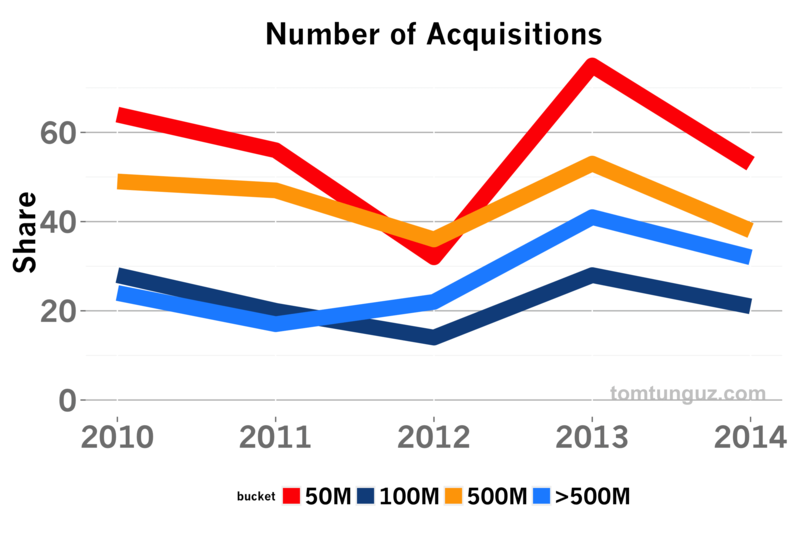 Looking only at disclosed acquisitions, I bucketed the past four years’ worth of acquisition by size: from $0-50M, $50-100M, $100M-500M and $500M+ and graphed the trends across those buckets. If you’re curious, the share of disclosed vs non-disclosed acquisitions has remained relatively constant over this period at about 80% of transaction values not disclosed. The chart at the top of the post shows the number of acquisitions remained relatively stable through 2012. But in 2013, activity increased across the board, and in the case of greater than $500M transactions, the number doubled. Six months into 2014, the number of the largest acquisitions (32) already exceeds figures from 2010-2012 (average of 18), indicating the trend of a growing number of large acquisitions is continuing. As the total number of large acquisitions has increased, so has the average and median value of the largest acquisitions. In 2014, the average large acquisition totaled $6.6B and the median reached $1.7B. The median is 50% greater than the previous four years. In other words, the big are getting bigger. I suspect the cause is the rise of growth capital, the delay of startup IPOs and consequently, the substantially larger size of the largest acquisition targets. Aside from >500M bucket, the typical value of an acquisition has remained relatively constant. The startup M&A market is healthy and stable in the sub-$500m range, and the M&A activity in the largest segments is vigorous and increasing, moving very much in stride with the IPO market.